The question of when to send an email or what the best time for your recipients to see your offer is, although asked and debated many-a-time, still doesn’t have a straight, go-to solution. This is because, as always, when dealing with people there are no universal answers; even so, one can appeal to the majority, so this week we’ll see why it’s a good idea to send email newsletters at a specific time. Is Monday the best time to send email newsletters? Is Tuesday the best time to send email blasts? Not as strong a “no” as a timed email sent for Monday, but still not a good idea I’m afraid. The reasons are similar to the above – people will have work to do (tasks received the previous day) and will most likely get annoyed by your intrusion. In fact, Tuesday is the day with the most unsubscribes for email newsletters, followed by Monday. Is Wednesday the best time to receive a timed email? If you’re after the simple answer, then yes! It’s certainly a better idea than not to think about your emails’ timing, since people are more relaxed on Wednesdays and will take the time to at least open your message. If you’re just sending a newsletter about something your recipient’s interested about (say, articles about sprockets), then your timed email may even come as a welcome pause from the hectic work schedule. How about sending a timed email blast on Thursdays? Oh, happy day; it’s Friday! Time your mass emails for Saturday! 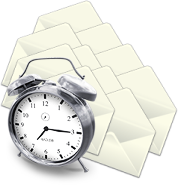 Did you know that 88% of the people you are going to send a timed email newsletter use their work email for everything? What this means is that they don’t have different email addresses for personal matters and for work, rather they just have different Outlook folders. So, your newsletter will be seen and opened; your recipients are relaxed and have the time to properly browse their Inbox so, in my opinion at least, Saturdays are right on top along with Wednesdays! Actually, since people tend to spend their money in the weekends and Saturdays have the lowest unsubscribe rates of the week, it may even be the best time to send all newsletters and offers! And finally… we come to Sunday! Just as the previous day, your timed emails will be read; it’s still a good idea, but I’d rather go with Saturdays, especially if you’re sending a commercial email detailing something that costs money. This is because people tend not to make any major decisions on this day (knowing full well that a new work week awaits). Additionally, your recipients’ attention will be drawn towards family matters, so the new 2012 model of the Super-Sprocket will not hold the same interest as on a Saturday (a day we all reserve for personal matters). One last thing: you should try to time your mass emails so that they’re the first thing your recipients see in their Inbox (they’re on the top of the email list). This means that the best time to send commercial emails is between 6:30 and 8 AM, although taking time zones and server lag into consideration, this isn’t that important. If you’re interested in such a precise timing for your emails though, note that unsubscribe rates rise after 11 AM. You know, a study I read some time ago stated that the majority of people (over 70% actually) read all their emails! Maybe not attentively, but they zap through them at least; so, don’t delay your email blast just because it’s not the right day! Send your followers exclusive offers, articles based on their interests, make them feel special and you’re sure to grab their attention; and, if you’re searching for a tool that lets you set-up specific time frames for your mass emails, then look no further than Easy Mail Merge for Outlook! With it you will be able to customize all your email blasts as well as manage their timing for the best results possible! As always, we are always interested in your feedback, so you can contact us either at support@emailaddressmanager.com or in the comments section below.